I ordered this dish at a restaurant once and they served it with canned diced tomatoes. I almost sent it back and I probably should have but I was really hungry. And this was during the summer months when tomatoes were plentiful. Perhaps their shipment for fresh organic tomatoes did not arrive that day and they forgot to remove (86) the dish from the menu for the evening. I also remember that the sauce was so overpowered with balsamic vinegar that it was almost inedible. And we were dining at a really nice restaurant. Oh well, every restaurant has a bad day, but I never went back--first impressions are everything. When I make a pasta dish I usually use whole grain pasta because it's healthier. This dish is my one exception because the ingredients are so few (only 7) that I have to use my favorite pasta, Bucatini. You can find Bucatini at specialty grocery stores in the Bay Area, or order online from the company who makes it, Maestri Pastai. It's somewhat expensive for pasta, but it's really worth it. Remember when you're cooking with few ingredients, you want each ingredient to be exceptional and this pasta dish is. Slice or quarter tomatoes depending on size and place in a large bowl. Add garlic, capers, basil, olive oil, salt and pepper to taste and let marinate/macerate for up to four hours at room temperature, stirring frequently so that juices and flavors are distributed. Fill a large stock pot with water and bring to a boil. Add a good amount of salt to the water (it should taste like the sea) and a splash of olive oil. My pot was not big enough and so I cooked the pasta in two batches, stirring for the first five minutes of cooking to make sure that all the noodles were not sticking together. The pasta takes about 15-20 minutes to cook until al dente. Drain pasta and rinse well under cool water and drain again. 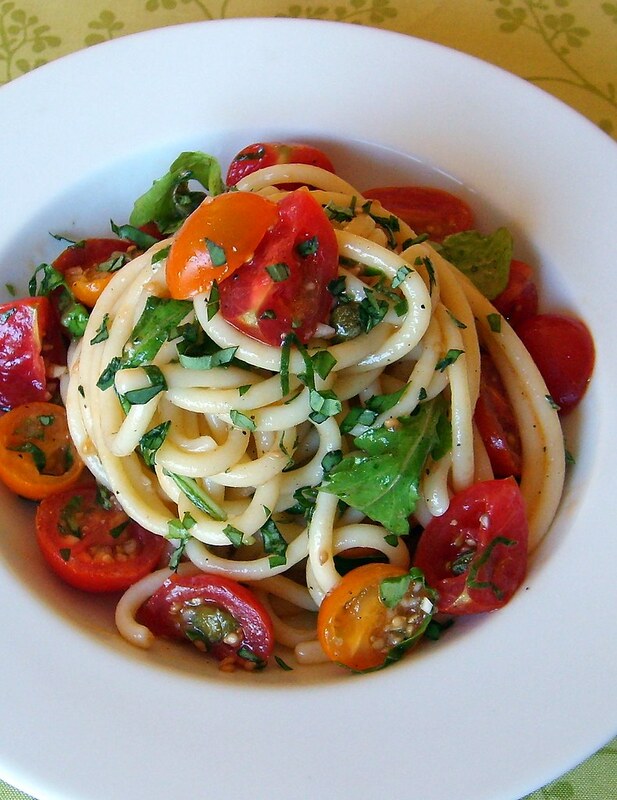 Add pasta to the bowl of fresh tomato sauce, along with the arugula and toss to combine. Taste and add additional salt and pepper, if needed and perhaps more olive oil. Serve pasta at room temperature garnished with additional basil.